Here's an effective treatment for painful, cramping or strained calf or shin muscles. 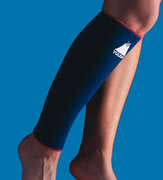 This calf support maintains beneficial warmth to your lower leg, enhancing circulation and diminishing calf pain. PowerFlex cohesive bandages offer superior strength and performance. Extremely high tensile strength. Abrasion and wear resistant up to five times that of any other support bandage. Provides dense protective padding, soft, lightweight and comfortable. Limited stretch and return elasticity maintains consistent compression. Will not tighten after application. Excellent cohesion, adheres strongly only to itself, does not stick to skin or hair. PowerFlex Bandages are superbly flexible and conforming to most difficult body shapes and contours. Unrolls and wraps easily. Ideal as a light elastic bandage or alternative to standard zinc oxide.